Shaolin is a classic martial arts film in many ways, with a great deal of spectacle and a protagonist who must come to terms with his own mistakes in order to grow as a person. There are a few unique elements as well, including the removal of a romantic subplot and its perfect resolution. 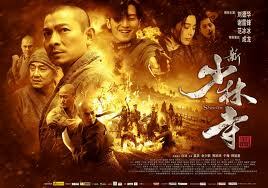 Mostly Shaolin feels like yet another in the wave of period martial arts epics which have been made recently, from IP Man to Little Big Man. They are each good in their own regard, though there is little about Shaolin to set it apart from the rest. The storyline in Shaolin goes in a full circle within the walls of a Shaolin temple. In the opening scene greedy warlords are battling it out for territory in a young Republic of China. Hou Jie (Andy Lau) is one of these ruthless warlords, unfeelingly killing his enemy within the walls of the Shaolin Monastery. This action is regarded very highly by Jie’s second-in-command, Cao Man (Nicholas Tse), a man who takes the treacherous lesson to heart. Turning on his commander, Cao Man overthrows Hou Jie, who is then forced to seek refuge in the very monastery he disrespected. With his traitorous second-in-command taking over with the tyranny, Hou Jie is finally able to see the error in his ways. As he grows used to life in the monastery, the former warlord learns a life of peace. Part of this comes from training with the monks, while the rest of his time is spent with the humble cook (Jackie Chan). In order to protect his people and the monks that have accepted him, Hou Jie must stand up to the man who destroyed his life.